I've heard bout this Potter mania since the launch of the first book "Sorceres's Stone" in 2001 but I never thought that I would join the crowd this year, after 6 years the book has successfully garnered world's attention. I'm into reading fiction novels, but mostly romance novels or thriller novels. I thot that it's only for kids..so, I was sooo wrong! Last week, my friend told me that a library nearby has more than just kids' story books. It has Malay and english novels. It was like a heaven sent to me. I was thinking of Sidney sheldon, judith mcnaught and so many authors that I like. Yeah, the library has sidney sheldon, translated in malay, danielle steel (also translated in malay). Very much to my dissapointment. Somehow, within all the translated novels, I managed to squeeze out a JK rowling book, the third one, Harry POtter and the Prisoner of Azkaban, and it is not translated in malay. And I thot, why not give it a try? First page, second page, I was not able to put down the book. Actually I've watched all Harry Potter's movies (er..except the latest one..) and I thot the movies were brilliant. The book is actually even better! It helps to explain things which could never be explained in the movies. Never I thot that I would fall ezly after reading the book. 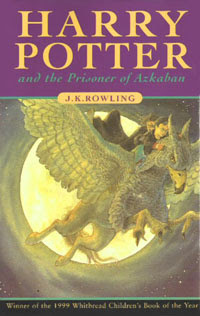 Completely fascinated, I borrowed the next chapter: Goblet Of Fire. However, I could only find the translated novel. But, since I was spellbound, I took it anyway and to my surprise, the translation is good. And now, guess what, I'm reading Order of Phoenix (also translated). Thanks to my failed Astro decoder (shot by lightning last week), I can fully dedicate my free time reading Harry Potter. By free time, I mean really free time..Out of office hour yerr ..
at least u found ur interest in books again ..mine comes sporadically ...ari tu minat dtg balik pick up a few books gak frm my opis library ..got hooked on a few indian authors.. Chitra Banerjee Divakaruni, Rani Manicka as well as chinese, Adeline Yen Mah ..pendek kata d non-anglo authors lah ..
mang aiii...ko mmg follow ek mende2 nie? aku sekadar nak tgk movie je pun sbb kalau baca mampos aku tak paham ape2. sedih ok...aku mmg mcm nie le keadaan nyer. bukan leh hayati satu2...sekadar boleh tgk movie itupun kadang2 terlelap. sbb maybe magic2 isnt my type of movie. bee..minat aku tak sampai lg ke author2 asian nih...maybe i shud give it a try kot..lg 1, aku tak sempat nak g kl sbb kat umah ade kenduri..next time yer..
rough, nak baca nih kena ader passion..bila ko baca, as if ko masuk ke dunia lain..bole release tension..